If it isn't enough that you will be celebrating one bundle of joy entering this world, imagine having two! Having twins is the ultimate blessing and is double the reason to have the baby shower of your dreams. Polka Dot Design is here to help with our wide array of twin baby shower invitations. The joys that being a parent allow are right around the corner. But we want you to get a glimpse of what that will feel like a bit early through our collection of birth announcements. The pride you'll feel in sending out the perfect announcement card is just a few clicks away. We can fully customize each card to your personal style or need, whether it's a baby boy, baby girl, or even a birth announcement for twins! Polka Dot will help you design the perfect twin baby invite. Our collection of baby shower invitations, too, cannot be matched. We have a plethora of choices from whimsical, fun designs to more delicate and precious invites. 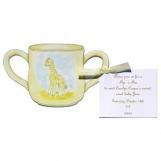 We make shopping for the perfect baby shower invitation a cinch with our huge assortment and tremendous variety. Perfect for every personality. Or perhaps you are not looking to reveal the gender of your baby just yet. If so, our arrangement of gender neutral baby shower invitations are worth taking a look! Ditch the specific blues and pinks that normally adorn these baby showers and instead find the perfect card to fit your style. We have a lot of trendy designs. 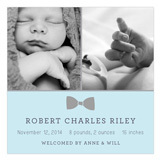 Try one of our bow tie baby shower invitations. These are for boys or girls. Save up to 20% or free shipping on twins baby shower invitations. For more information, email us or call the Polka Dot hotline. We will answer any party idea or shower questions.